And now, it’s time for the VOA Learning English program Words and Their Stories. In some parts of the world, April is a time of thunderstorms and lots of rain. In the U.S. we even have a rhyme to describe it: April showers bring May flowers. This rhyme does not simply describe a weather event. It reminds us that even something bad or inconvenient -- in this case, rain -- can bring something good -- in this case, flowers! We will talk about flowers expressions another time. Today, let’s talk about rain. Even though rain is necessary for nature, many expressions use rain to represent troubles, loneliness or hard times. To rain on someone’s parade is to question their positive attitude or to ruin their good time. Someone who rains on another person’s “parade” is usually trying to introduce a note of caution or practical advice. This person may not mean to make the other person feel bad, but raining on someone’s parade can really kill a good mood. By the way, this is a fixed expression. So, you shouldn’t say, “Don’t rain on my picnic!” or “Don’t rain on my baseball game!” People will have no idea what you’re talking about. No one has a perfectly happy life all the time. A poetic way to express that thought is to say into each life a little rain must fall. Portrait of Ella Fitzgerald in New York, N.Y., Sept. 1947. Library of Congress. William Gottlieb, photographer. Here is singer Ella Fitzgerald complaining that she is getting more than her fair share of suffering. When it rains, it pours is another popular expression. This means when one bad thing happens, many other things often follow. Now, there isn’t any science to support this. Perhaps it just feels that way when it’s happening to you. Some people are so happy, so excited or so in love that they don't let anything -- including the weather -- stop them from doing something. Come rain or come shine means you are not going to let anything stop you. Many people have sang the Johnny Mercer song “Come Rain or Come Shine.” Here, it is Ray Charles who tells his love that he will love her no matter what. Sometimes, though, you can’t do what you want come rain or shine. Sometimes rain does affect your plans. Let’s say you plan a big outdoor party for all your friends. Unfortunately, on the day of the party, it rains cats and dogs – in other words, it rains really heavily. You will have to reschedule. Your guests can take a rain check and come back another time. “Rain check” comes from the early days of baseball. 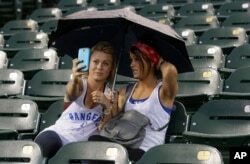 If a baseball game was canceled because of rain, attendees were given a piece of paper -- a rain check -- allowing them to come back on a different day to see the game. So, when you take a rain check on something you will have to wait before you can do it. In comparison, when you save something for a rainy day, you choose to put it safely away for future use. Usually we use this expression for saving money. But you can save anything for a rainy day. Up until now, all these rain expressions use the wet weather as a hardship, sadness, inconvenience or difficulty that a person must overcome. One exception is the expression right as rain. If something is “right as rain” it is perfectly fine. For example, let’s say you hurt your back playing sports. You could tell your friends not too worry and that you’ll be right as rain in a week or two. Some word experts say that “rain” is used in this expression simply for its “r” sound. “Right” and “rain” sound good together. And that brings us to the end of this program. But come rain or shine, we will be back next week with another Words and Their Stories. Let us know if you have any rain expressions in your language in the Comments Section. Anna Matteo wrote this story for VOA Learning English. Kelly Jean Kelly was the editor. The Cowboy Junkies sing “Southern Rain” at the end of the show.